A history of the Japanese wood-block print is on exhibit at the Carnegie. The West's fascination with Japanese art is as evident now as it was in the late 19th century, when Europeans feverishly collected art of Japan, and impressionist and post-impressionist painters were duly inspired by the Japanese aesthetic. In 2007, with the popular consciousness embracing works from Hokusai's iconic "The Great Wave" to manga comics and Japanimation, the Carnegie Museum's Modern Japanese Prints exhibition should appeal to a diverse audience. Curated by Sandy Kita, most of the 200-plus works in this survey of woodblock prints are drawn from the Carnegie's James B. Austin collection. (The rest come from four private collections in Pittsburgh and other holdings at the Carnegie.) Austin, a U.S. Steel chemist and vice president until 1968, bequeathed the majority of this important collection to the museum in 1989. In its entirety -- nearly 2,600 prints -- it includes everything from traditional images of Buddhist deities to contemporary abstractions. For the current exhibition, Kita focuses on ukiyo-e woodblock prints, the majority of which were produced between the 17th and 20th centuries. Ukiyo-e prints, also known as "art of the Floating World," primarily depict the courtesans and actors of the elite, urban "fantasy" culture of the entertainment district of Edo (Tokyo). The works selected by Kita are meant to show how the traditional imagery of Edo's brothels and theaters expanded over time to include Japan's day-to-day realities, landscapes, and records of the artists' travels. This reflected the changing political and social climate, leading to Japanese art more focused on individual expression. The exhibition is divided into three sections. The first represents the Meiji Era, which began with the fall, in 1868, of Japan's feudal government. These prints reflect the artists' interest in the political and cultural turmoil resulting from the collapse of centuries of shogun rule. Four politically themed prints from Yoshitoshi's series A Mirror of Famous Japanese Generals are on view, as is his "Thirsty: The Appearance of a Town Geisha, A Bar Girl, in the Ansei Era (1888)." The latter is a stunning portrait of a geisha, representing the enduring interest in ukiyo-e subject matter. The second section of the exhibition reflects the Shin-Hanga (new prints) of the 20th century, which were typically collaborations between an artist, a woodblock carver and a printer. The subject matter consists of more traditional ukiyo-e subjects such as actors, landscapes and courtesans, and perhaps reflects nostalgia for Japanese traditions. Hashiguchi Goyô's geisha prints, including "Woman in a Long Undergarment" and "Woman in a Summer Garment," are elegant woodcuts that exemplify the flat sections of vibrant color, the simplified forms, and the addition of detailed patterns that so typify a Japanese aesthetic. Finally, on view are the Sôsaku-Hanga (creative prints) that developed parallel to the Shin-Hanga style. These prints were often carved and printed by the artist himself -- a rejection, in a sense, of old practices. This movement was heavily influenced by Western avant-garde art, which inspired many Japanese artists to experiment with technique and imagery. 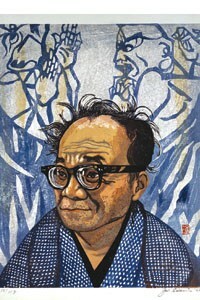 Sekino Jun'ichirô's "Portrait of Munataka Shikô" (1968) depicts Shikô, a printmaker, standing in front of his "Ten Great Disciples of Buddha." The large portrait shows the artist, wearing heavy black glasses, overwhelming his own print, and suggests the importance of the artist's ego and a new focus on individualism in the art of Japan. Modern Japanese Prints is based on a complex curatorial premise, and provides a thorough look at the history of Japanese printmaking. Discovering how the styles and themes of Japanese art have evolved will help contemporary viewers to both contextualize some of the popular Japanese art of today and better appreciate its illustrious history. The artist takes the foreground: Sekino Jun'ichirô's "Portrait of Munataka Shikô" (1968).